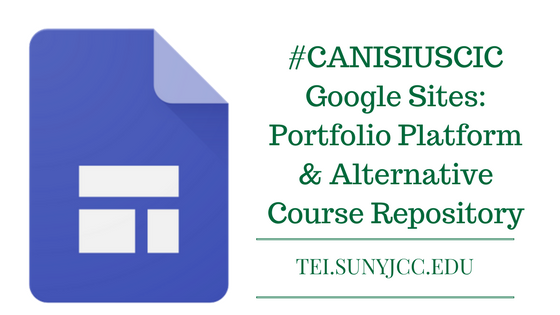 Yesterday, Canisius College put on a highly informative technology training day. I picked up a lot of great ideas. The first presentation was by Marya Grande, an Associate Professor in the School of Education and Human Services. In her presentation, she shared how she used Google Sites as a portfolio platform and a course repository. To begin, I really appreciated that Marya used Google Sites as her presentation platform. You can see what she shared through this link. In her presentation, she focused on creating content using the new Google Sites platform. Grande highlighted a number of benefits for using Google Sites. Here are the keep benefits that resonated with me. You can add more content to a Google platform than you can to a typical learning management system (LMS) such as Blackboard, Moodle, or Canvas. The student can take the content with them from course to course as well as when they leave the institution. It is easy to use and update. You can quickly and easily import other Google assets. You can easily share a site with others both publicly and privately. Grande uses Sites as a course repository rather than publishing content to the LMS. One of the primary reasons for doing this is so that students can access the content after the course ends. Other ideas for using Google Sites include creating a digital notebook and providing course supports. Course supports could include instructions for various digital tools used in the class. With Google Sites, you can add video, audio, text, and embed Google application documents. One feature that is not included in the new site, yet, is the ability to add comments to a page. Grande uses comments to have students respond back to content shared by other students. Fortunately, we discovered a workaround to add comments. Sites would be an excellent tool for creating an eportfolio both for students and faculty. With an eportfolio, participants could bring their portfolios to life by sharing video, audio, text, and embedded Google documents. This is something that is difficult to do with a strictly paper-based portfolio. Grande shared a couple of examples of student portfolios using both the old and new site format. To make life easier for her students to share their content, she included some supports for creating tiny.urls and QR codes. If you are interested in exploring Google Sites, you can drop by the TEI Synergy Center and speak with a member of the TEI team. You can also learn more at the G Suite Learning Center. How are you or will be using Google Sites for your classroom? Leave a comment below.